Rent Houston Marriott Westchase | Corporate Events | Wedding Locations, Event Spaces and Party Venues. Discover the west end of Houston, TX at the Houston Marriott Westchase. Our hotel offers spacious, well-appointed rooms, a contemporary Texas-themed decor, high-speed Internet available throughout our AAA rated 3-diamond hotel. Other amenities include indoor/outdoor heated swimming pools, a fitness center, free parking, two restaurants and Starbucks® coffee house. The Westchase section of Houston is conveniently located near key Houston landmarks like Reliant Stadium, Rice University, The Uptown Galleria Area, and home to companies such as National Oil well Varco, Honeywell, and BMC Software. A few minutes from the hotel is the I-10 Energy Corridor, a business hotspot for Energy powerhouses like ExxonMobil, Shell, BP, Schlumberger and many others. Along with amazing rooms and service, we have 43,000 square feet of available meeting space for your next conference or event, including the Grand Pavilion Ballroom, which has seating for 1,725 guests. 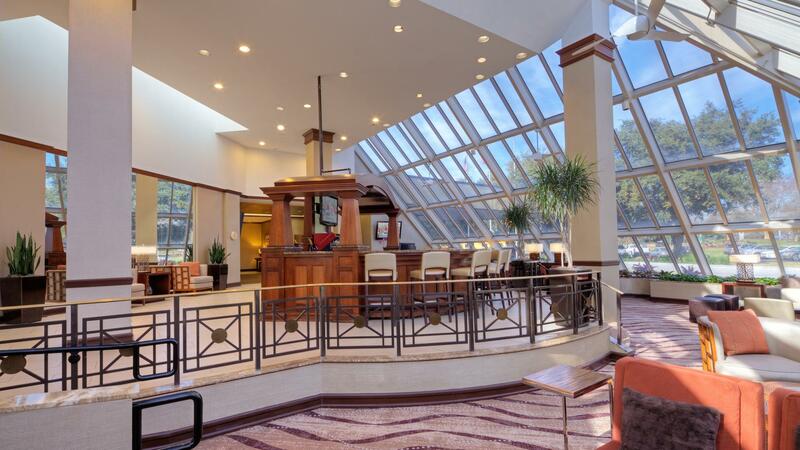 Book your stay at The Houston Marriott Westchase Hotel today. Configure over 43,000 sq ft of space, located on our Houston hotel's main floor, to suit your needs. Use our state-of-the-art equipment and on-site tech pros to make your Westchase meeting stand out. Stay in business throughout the hotel with high-speed Internet in our all rooms and meeting spaces. Drive into Houston with no problems; we have hotel valet and self-parking for up to 1,000 cars. Let our Marriott Event Menus address every need like meals, breaks, staff, and equipment rentals. Choose from one of our 23 event facilities and find the ideal meeting space for your business event. Use our hotel as the venue for your Houston wedding reception. Our location can handle all sizes. Plan the perfect wedding and reception. Our hotel caters to all different tastes and budgets. Go big, Texas style, with our Grand Pavilion Ballroom venue location, with seating for 1,725 guests. Get help from our Marriott Certified Wedding Planners, who are ready to assist you in every detail. Don't worry about parking spaces. Our venue offers valet or self-parking for up to 1,000 vehicles. Relax knowing our event manager and expert staff will help make your Houston wedding a success.